The Convention on International Trade in Endangered Species of Wild Flora and Fauna (CITES)’s recent worldwide ban on all 8 species of pangolins has brought cheer to the conservation community. Pangolins face grave threats to their survival not only from the illegal wildlife trade, but also from habitat loss and a low reproductive rate. Female pangolins produce only one offspring a year. 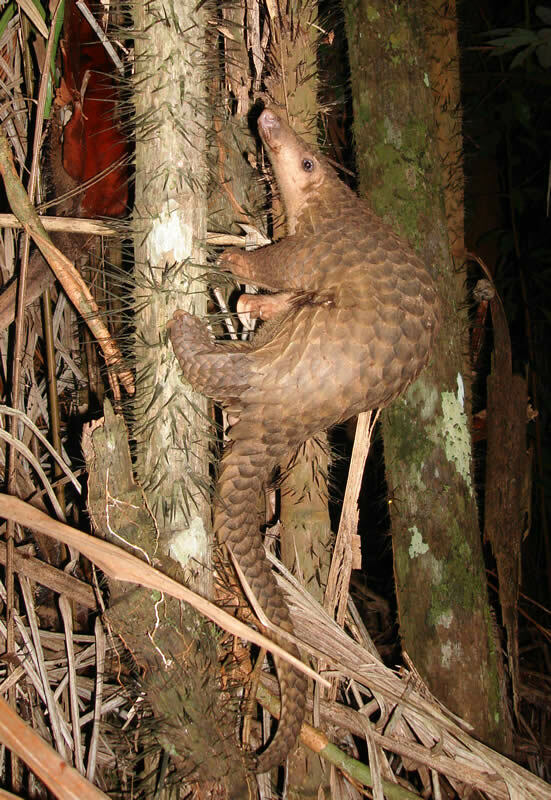 Pangolins play an important role in the ecosystem, as their diet consists of ants and termites, and they thus provide biological pest control. It is estimated that a single pangolin consumes over 70 million ants and termites a year, and from this fact, one can imagine the role of pangolins as nature’s pest controllers and soil caretakers. Pangolins, including the Sunda / Malayan Pangolin (Manis javanica) are considered the world’s most trafficked mammal and are at risk of extinction due to relentless hunting and poaching, especially for the China and Vietnam markets, where pangolin meat is considered a delicacy and a status symbol. Pangolin foetus soup ostensibly improves male virility, while pangolin scales are ground into powder and used to treat rheumatism and skin disease, although like rhino horns, the scales are made of keratin, the same protein that forms human hair and fingernails, and there is no scientific or medical evidence to support the claim that it has any healing or beneficial properties. It is hoped that the CITES trade ban will not only eradicate legal trade in pangolins but also reduce illegal trade by influencing consumer behaviour. However, a trade ban is only as effective as its enforcement. According to the International Union for the Conservation of Nature (IUCN), numbers of wild Sunda pangolins have decreased by half in the last 15 years. Studies by TRAFFIC, the wildlife trade monitoring network, reveal that as pangolin populations are depleted in Indochina, wildlife dealers currently source pangolins from Malaysia and Indonesia. Its studies also found that the pangolin trade has spread to Sabah and Sarawak due to the decline in the pangolin population in Peninsular Malaysia. According to the report by TRAFFIC, interviews with pangolin hunters in Sabah reveal that the hunters are aware of the illegality of hunting pangolins, and the critically endangered status of pangolins. However, the hunters admitted that the lucrative price made it difficult for them to stop hunting pangolins. In order for the pangolin trade ban to be effective, enforcement agencies must treat wildlife trade as a serious international crime that threatens not only wildlife populations and the natural environment, but also ultimately human survival. Wildlife law enforcement agencies and prosecution bodies must cooperate with environmental organisations and monitoring bodies to eradicate corruption, stop wildlife trade, incapacitate wildlife trafficking syndicates and mete out the most severe punishments possible for wildlife offenders. There are reports that live pangolins confiscated by enforcement agencies are frequently released in their weakened state without planning or monitoring, and this jeopardises their chances of survival. Thus efforts to ensure the survival of pangolins should also encompass the rehabilitation, management and subsequent release of confiscated pangolins. The international trade ban and enforcement of anti-wildlife trafficking laws must necessarily be complemented by public education and awareness efforts in order to succeed. This is where members of the public come in. We can all play a role in phasing out and ending wildlife trade and preventing the extinction of pangolins. As conscientious and informed members of society, we must speak out and use our persuasive powers to influence others to reduce the consumer demand for pangolins and other wildlife. Even those of us who are not educators or volunteers can speak to others, including the younger generation, rural and indigenous communities and senior citizens who believe in the curative powers of wildlife-based traditional medicine, and educate them not only of the role of pangolins in the ecosystem, but also of the fact that the entire wildlife-based traditional medicine industry is a sham designed to enrich a few profiteers and impoverish the gullible. This is why measures such as captive breeding and farming wildlife and creating biotech substitutes for wildlife products such as rhino horns and bear bile are ineffective in ending wildlife crime – because they continue to reinforce the belief that there are curative properties to pangolin scales, rhino horn, bear bile and other wildlife products. To end the exploitation of and illegal trade in wildlife, we must be unequivocal in educating wildlife consumers that there are no benefits to consuming wildlife parts, and there is no such thing as legal or sustainable trade in wildlife. 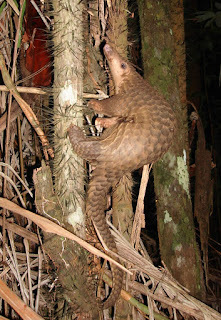 Given the popularity of travel to other East Asian and Southeast Asian countries, travellers can do their part not only by not consuming or purchasing pangolin wine, meat, scales or other wildlife products, but actively speaking up and informing tour operators and fellow travellers that they refuse to enter any establishment that offers pangolin products, bushmeat, exotic pets or other wildlife products. Travellers must vote with their money and their voice by writing in to tour agencies, national wildlife enforcement agencies, wildlife monitoring bodies and animal welfare and conservation NGOs operating in the relevant countries to complain about and report wildlife crimes. It is helpful to take photos as evidence and compile as much useful information as possible, including locations, dates and other information that will aid in tracking down and identifying wildlife offenders. Crimes, including suspected crimes (e.g. a restaurant offering ‘special meat’ and ‘special dishes’) against pangolins and other wildlife in Malaysia can be reported to the 24-hour MYCAT Wildlife Crime Hotline at 019 356 4194 or report@malayantiger.net. Everyone should participate in efforts and organisations that create, fund and support initiatives to not merely educate, but also empower and provide alternative and sustainable livelihoods for rural and indigenous communities to reduce and eventually eliminate their need for poaching and hunting. The fact remains that in many parts of the world, indigenous communities are forced off their ancestral lands and denied the opportunity for meaningful participation in the natural resource economy, thus driving them to hunt and poach wildlife for their economic survival. We cannot effectively protect wildlife and habitats without considering the human factor. This is where the rest of us come in as consumers, travellers, donors, sponsors, volunteers, advocates, social media users and supporters. Protecting endangered species is not the role of the Department of Wildlife and National Parks (PERHILITAN) or conservation NGOs and experts alone, and the environmental responsibility of ordinary citizens and consumers goes beyond merely recycling our bottles and having shorter showers. Species conservation is our shared duty and responsibility, and pangolins and other wildlife need us as their defenders and protectors now more than ever.